Obama’s stadium plan would limit public financing of sports complexes. Could that end the war over sports teams? Cities and suburbs compete for the privilege of wasting millions on new sports complexes. Obama has an idea to end the madness. Georgia Gov. 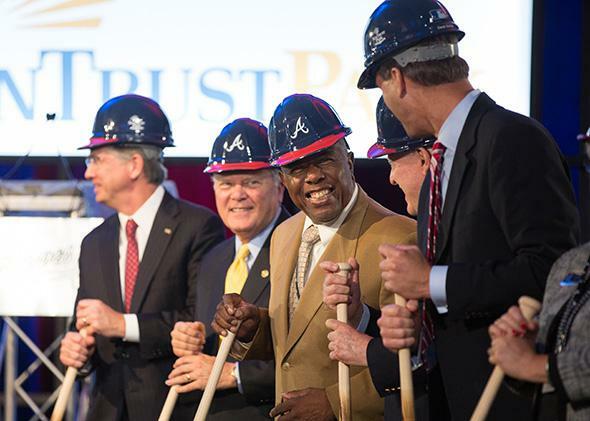 Nathan Deal, second from left, and Hank Aaron, third from left, participate in a groundbreaking ceremony at the new Atlanta Braves stadium last year. In 2013 the city of Atlanta lost its baseball team to one of its suburban neighbors, the more prosperous and populous Cobb County. The Braves won’t move for two more years, but in the meantime, one Georgia state senator from Atlanta has come up with a crazy idea: Expand Atlanta’s municipal boundary by nearly 2 miles into unincorporated Cobb County, and annex the 60 acres where the team is building its stadium. The proposed land grab is about as likely as 81-year-old Hank Aaron starting this season in right field, but it might not be any less reasonable than the proposal from the Braves that Atlanta rejected: Hand over $77 million in real estate and float a $200 million municipal bond issue to rehabilitate a ballpark still in its teenage years. What happened in Georgia was a lesson in the business of American pro sports. Like the San Francisco 49ers—the ones now playing in Santa Clara—the Braves took advantage of a highly fragmented metropolitan area to pit city and county against each other in a kind of prisoner’s dilemma. After more than a year negotiating with both governments, the Braves got what they wanted from Cobb: $397 million in public money for stadium construction. At the center of such stadium bidding wars are government bonds, which, in Cobb County, will be paid off mostly by homeowners. For a ballpark in their backyard, they’ll fork over $8.6 million in property taxes every year for the next three decades. They’d better hope the Braves stick around longer than the 20 years they will have spent in Atlanta’s Turner Field. Or better yet: The next time the Cobb County Braves decide they’re ready to spin the Wheel of Taxpayer Subsidy, we should all hope the whole practice has become illegal. That’s what the Obama administration proposed in its budget last month: to end the issuance of tax-free government bonds for professional sports facilities, a practice that has, according to research by Bloomberg, siphoned $17 billion of public money into arenas for NFL, MLB, NBA, and NHL franchises over the last 30 years and cost Americans $4 billion in forgone federal taxes on top of that. It’s too late for residents of Cobb County, but Congress might yet save the rest of us some dough. Extortion at the hands of our sporting oligarchs is, of course, a popular source of outrage. The U.S. has enough major league sports stadiums built with public money to fill an NCAA bracket. The ascent of stadium costs and the financial myopia of public officials ensure that the contest will stay lively for some time to come. So how did we wind up in this situation? Local authorities have long used tax-exempt bonds to raise money for certain private uses—whether factories, train stations, or home mortgage loans—in addition to schools, sewers, and other infrastructure projects. In most cases, the ensuing economic growth was at least intended to pay back the municipal investment. Sports stadiums were no different: Governments could raise money in exchange for a share of future revenue. After an initial attempt in the 1960s to steer government bonds toward true public works, Congress placed a provision in the 1986 Tax Reform Act that seemed sure to kill tax-free, no-limit stadium deals. It had exactly the opposite effect. Essentially, qualifying projects now need either to serve public uses or to rely on public funding. With pro sports facilities, the former is obviously impossible, so the latter, though politically improbable, has become the way billionaire team owners retain access to cheap government financing. Cities and counties wound up borrowing more for their teams than ever before. It’s been clear for decades that new stadiums don’t bring the business they promise, let alone enough economic activity to justify the investment. It’s a ruse, but it works because public officials are more worried about being blamed for the loss of a team in the short run than, say, for failing public schools in the long run. And it works because the country has more big cities and rich counties than sports teams in each league, so that even if Cincinnati taxpayers wise up, their counterparts in Austin will step in. But with only two intercity moves in the last 17 years of the NFL, MLB, and NHL (NBA teams have been more mobile), it’s clear that the era of big moves has largely made way for a period of intra-metropolitan battles. These face-offs don’t grab national headlines, require new jerseys, or motivate big fan protests. But they cost just as much money. Atlanta is just one recent example. When voters on Long Island rejected a $400 million renovation of the Nassau Veterans Memorial Coliseum, New York Islanders owner Charles Wang announced he would move the team across the county line to Brooklyn’s new Barclays Center, which was able to pick up hundreds of millions of dollars in subsidies. The 49ers spurned an offer from San Francisco and instead moved some 40 miles down the peninsula to Santa Clara. Obama’s budget isn’t the first national political effort to impose federal taxes on stadium deals. New York Sen. Daniel Patrick Moynihan proposed ending the loophole in 1996, and it’s been kicked around in committee since. But with groups like the Koch brothers’ Americans for Prosperity now opposing stadium deals at the local level, Obama’s idea has a chance of gaining bipartisan support. Still, it wouldn’t stop cities from paying for stadiums. The last time Congress made public financing more onerous, in 1986, the result was a disaster: Cities jumped to meet the new, harsher terms, opening a three-decade stadium construction spree. One solution, instead, could be to change the way teams operate, either by bringing antitrust suits against the leagues (which sports economist Andrew Zimbalist has suggested) or by allowing cities to exert greater control over their brands (as law professor Mitchell Nathanson has imagined). Should names like the Irving Cowboys, the East Rutherford Giants, and the Orchard Park Bills be forced upon suburban squads? In his 2000 book Leveling the Playing Field, Harvard Law professor Paul Weiler fantasizes about a nationwide union of cities that could lock out pro sports teams to obtain a league-imposed “stadium cap” on taxpayer subsidies, which would effectively end bidding wars. Stadiums may be the brightest stars in our constellation of subsidized businesses, but they are not the biggest. The main event, for subsidy reformers, is the $80 billion per year in tax breaks and incentives that cities, counties, and states use to lure and retain corporations of all stripes. In Camden, New Jersey, the state is providing a $315,000 subsidy per job. If Tesla’s growth projections in Nevada fall short—as they so often do in these deals—the state could wind up paying $400,000 per job. It’s a destructive cycle for every function of government and a zero-sum game. That’s a crisis that tests the limits of federalism. If we’re going to meet it, we might as well warm up with a little baseball.